The Shire Horse Society will hold its Annual Dinner in conjunction with the National Shire Horse Show in the Members’ Pavilion at Stafford County Showground on Friday, 20th March, 2020. The President invites both members and non-members to attend this friendly evening where guests will enjoy a three-course meal. The evening starts at 7.30 pm and tickets are priced at *£35.00 and available to purchase via the booking form below. Dress code is lounge suits. 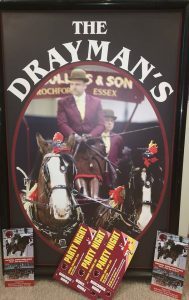 The Drayman’s will be open on Friday, 20th March from 5.15pm for those wishing to purchase food and drink on site. Please support this new area which is open to exhibitors and the general public. The Drayman’s will host the Saturday social evening which will be an informal fun “Party Night” with food and entertainment from 7.30pm (The Drayman’s will be open from 5.15pm). Everyone is welcome to join in and admission is by ticket only and costs just *£10.00 per person. These will be available to purchase via the following form or booked up to 12 noon on the Saturday. (This is to help with the catering). Ringside hospitality is available at the Show for *£60.00 per person on Friday, Saturday and Sunday. Included in the price is lunch with tea and coffee during the day. If you would like to watch the Show in comfort whilst being looked after then this is for you! We regret that no children are permitted in this area. If you would like to join us please download the booking form below and return with full payment by 8th March 2020 to the Shire Horse Society, Shire Farm, Rockingham Castle & Park, Uppingham Road, Rockingham, Market Harborough, Leicestershire, LE16 8TP.